> Explorer GPS Giveaway � Clarion Multimedia Player worth $1,199 to be won. 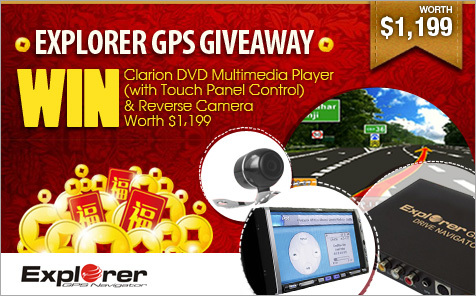 Explorer GPS Giveaway � Clarion Multimedia Player worth $1,199 to be won. Take part in our monthly sgCarMart contest by answering questions about the Explorer GPS Add-On Device and stand a chance to win Clarion DVD Multimedia Player (with Touch Panel Control) & Reverse Camera worth $1,199. Maps are useful to guide us to our destinations that we are unfamiliar with. Yet many of the audio head units available in the market do not come with this essential feature, which is why the Explorer GPS Add-On device might be your next best friend, in your car. Equipped with Galactio map, this GPS add-on device delivers rich features in an intuitive and user-friendly environment. The list of features includes ultra-fast route calculation, traffic avoidance routing, 3D buildings & road elevation graphics, live traffic information and even weather forecast. The small and slim peripheral can be easily installed, without modify any electrical or wirings. This Explorer GPS add-on device is a quick, plug and play integrated solution with GPS navigation function for all audio head units with monitor. Fast and easy integration to any existing audio players of most brands such as Pioneer, JVC, Kenwood, Alpine, Sony, Clarion, Blaupunkt, Philips and etc. More than 1,500 sets of Explorer GPS add-on device have been sold in Singapore since 2011. All purchases of this GPS integration device come with FREE Map Update and Warranty for 12 months. For more information, please visit here. Take part in our sgCarMart contest and stand a chance to win attractive prizes! Fong Kim's M-Tek ECU Giveaway � Freepower Sdrive total worth up to $900! CARSPEED Pro Power Coil Giveaway - Power coil worth up to $850 to be won!